If you listen to electronic music at all, you’ve probably heard of Kaskade. 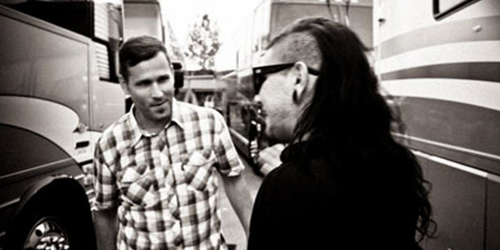 World renowned DJ Kaskade recently just dropped a killer new album with tons of banging electro songs on it, but I’d really like to feature the one he did with dubstep icon Skrillex. It’s not your typical Skrillex track — so give it a listen even if you’re not a fan! What’s so awesome about this particular track is that it takes two amazing DJs and throws them together on the same track. It’s really nice to hear Skrillex branching out a little bit from his “comfort zone” because sometimes I feel (and I’m sure I’m not alone at this point) that his music all sounds kind of the same and repetitive. He likes to use the same effects over and over again. Don’t get me wrong, I absolutely love him as a DJ, but this track has just enough of his signature style in it so you know he’s laying down some funky bass, but also mixes in Kaskade’s style to really change things up. I highly recommend checking out the entire album, Fire & Ice, as it is certain to not disappoint! **UPDATE 11/16/11** I’m also going to include the Kaskade ICE Remix of the track off the album. It’s way different from the original and is a laid back, “chill out” track. Very relaxing and pretty awesome.